Devil Rays' scouting report on rookie Brent Abernathy: "Man, this kid's enthusiasm is something special. Look at that look of excitement on his face. ... 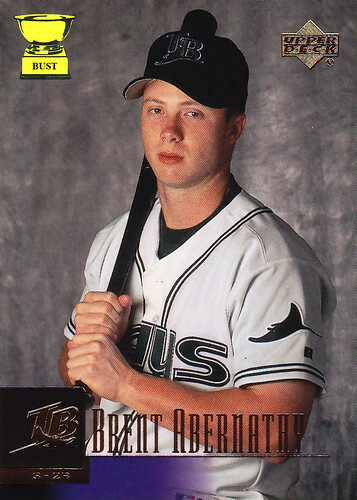 If baseball doesn't work we can use him in the devil ray tank, as bait. ... Has the personality of chum. ... Looks like an athlete, a kick ball athlete, but an athlete nonetheless. ... Wears the 'TB' on his cap well: Total Bust. ... We think we've found his natural position: far from the field, in a Sears photo studio. ... Forget this kid, let's look for more players name 'Ray.'"